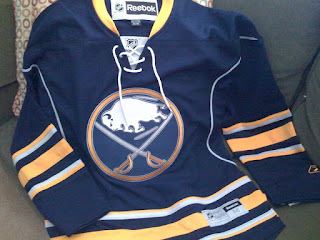 After two failed attempts to get one of the new/retro Sabres alternate jerseys, I finally have one. I originally ordered one the first week in November, after discovering they were actually available online. I had watched the status go from "not available in my size" to "available in my size by February 12" to "available in my size by November 26". Then I realized the size I had ordered wasn't going to fit anyways so I ordered another one. Long story short, they both ended up being back-ordered by 14-16 weeks, so the dates shown when I ordered were meaningless anyways. The delay eventually became so long that my order was at risk of being canceled because the stores didn't want to keep the order in their system that long. So much for keeping a place in line. Frustrated, I ultimately searched on Amazon on a whim, and low and behold, I found a vendor who had one, yes one, in stock in my size. That and it was $20 cheaper than the ones I had on back-order. Score! So, it finally arrived today and I have it in time to wear to the game in two weeks.